I've written quite a few times about Seth Miller the Wandering Aramean and Hotel Hustle, his tool for searching for award space across hotel chains. Like most (all?) his online tools, it's undocumented, which means it requires quite a few rounds of trial and error before you get the hang of its, shall we say, nuances. Just yesterday I discovered another one of those nuances that I thought readers might appreciate. 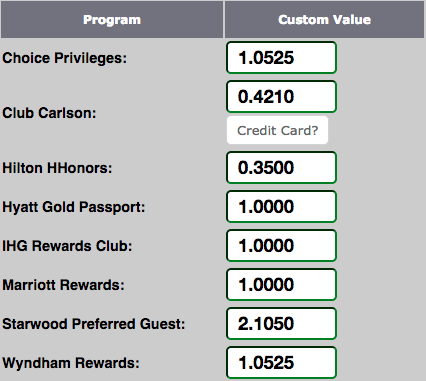 As a newly-minted Hyatt Diamond, I've been doing a lot of searching for Points + Cash rates to fill out my travel schedule for the year, and to do so, I've spent a lot of time using Hotel Hustle. Flag #1 asks, "is there a cash rate available?" Flag #2 asks, "are there rooms available for all-points redemptions?" Flag #3 asks, "are there rooms available for Points + Cash redemptions?" If there are rooms available for all-points redemptions there should be cash rates available, but the same is not true for Flags #3 and #2; in the course of researching this post I discovered a property with Points + Cash availability but with no points-only redemptions available. It looks like Hyatt doesn't have any properties in Philadelphia, so I'm out of luck. It turns out Hyatt has all sorts of properties in Philadelphia! That Hyatt Place in Mt. Laurel looks promising, but unfortunately it doesn't have any points-only or Points + Cash award availability. I'm in luck! Points + Cash rates are available, securing me a precious stay credit towards requalification. Each of the above pictures illustrates a particular combination of flags, each of which you need to understand to get all the information you need from Hotel Hustle. The first picture illustrates the situation when none of the flags are "true:" Hotel Hustle will not help you. You cannot configure any kind of alert for a property that does not have any rooms available for cash. The second picture illustrates a situation where only Flag #1 is "true:" Hotel Hustle will allow you to set an alert for points-only award availability in the righthand sidebar or, if you can locate the property on the map and click on it, set an alert for Points + Cash award availability. The third picture illustrates the (unusual) situation where Flag #1 and Flag #3 are "true," but Flag #2 is "false." Hotel Hustle does allow you to set a points-only alert in the righthand sidebar, but it only allows you to view Points + Cash availability by locating the property on the map and clicking on its icon. What if you're not interested in qualifying or requalifying for Diamond status with Hyatt and just want to save some money on your next Hyatt stay? In the second picture above, you can see that you can create both points-only and Points + Cash award alerts through Hotel Hustle. But if you are indifferent between the two, you need to create both types of award alert. The "C&P Alert?" column designates whether the alert is for Points + Cash or a points-only award availability. I poke fun at Seth for not documenting his web apps, but in all fairness, even if he did I wouldn't read the documentation. At the same time, since I just figured out how this worked I suspect there's a chance it will be of value to some of my readers! One fascination of the miles and points community is "valuing" their loyalty currencies. This should be, in principle, one of the most important aspects of an earning strategy: earn more valuable points before less valuable points is a mantra as obvious as it is useless. But determining the value of points is vigorously disputed terrain. I love Hotel Hustle, and write about it relatively often. It has two relevant features here: you can plug in your own points valuation and search by "Hustle Hotness:" what percentage of your assigned value you're getting at each property in your search destination. But additionally, Hotel Hustle will show you the range of values other people using Hotel Hustle have found on their own, real-world searches. For these purposes I've always like the median value, which has 50% of search results giving more value, and 50% of searches giving less value. So across all the tabulated Hotel Hustle search results, you can see that Hilton HHonors points are worth a median of 0.44 cents each. That doesn't mean you'll get 0.44 cents per point, but it's a benchmark you can use to evaluate your earning and burning decisions, and it's based on real-world award search results. Bankrate.com employee Brian Kelly will tell you each month what cards have the biggest affiliate payouts. Likewise Thought Leader from Behind Gary Leff will periodically post his updated points valuations. And of course Rich Weirdo Ben Schlappig has a whole page devoted to valuing miles and points. The concept of "revealed preferences" is a powerful one in behavioral economics. Rather than attempting to establish the value of goods in the abstract, or by measuring quanta of pleasure, revealed preferences allow you to determine a good's value to the consumer by the price they're actually willing to pay for it. Revolutionary, right? 1.4 SkyMiles are worth about 2 cents. When buying cheap, PIN-enabled prepaid debit cards at unbonused merchants, I split my purchases between my American Express Delta SkyMiles Platinum Business card and my 2% and 2.105% cash back cards. My indifference between earning 1.4 SkyMiles and 2% cash back means I value SkyMiles at about 1.43 cents each. 6 Hilton HHonors points are worth up to 4 cents in airfare. I only have a single local grocery store that sells PIN-enabled prepaid debit cards, and I can choose between using my American Express Hilton HHonors Surpass card or my US Bank Flexperks Travel Rewards card. I use my Surpass card, valuing each HHonors point at up to 0.67 cents in paid airfare. 2 Ultimate Rewards points are worth slightly less than up to 4 cents in airfare. As above, I have a single local merchant that codes as a gas station and sells PIN-enabled prepaid debit cards. I could use either my Chase Ink Plus or my US Bank Flexperks Travel Rewards card for purchases there, but lean towards the Flexperks card, valuing an Ultimate Rewards point at slightly less than up to 2 cents in paid airfare. My situation is unique, as is yours. I travel all the time, and am dedicated to keeping my rewards balances as low as possible, meaning I'm not stockpiling millions of any one currency. Instead, I'm redeeming miles and points roughly as quickly as I redeem them, giving me lots of "gut-check" opportunities to see whether I'm getting enough value from my rewards currencies to justify earning more of them. For example, in January I had decided to cancel my American Express Delta SkyMiles Business Platinum card, when a health emergency in the family caused me to redeem most of my SkyMiles balance at a value of over 5 cents per SkyMile. With an empty SkyMiles account, and the possibility of future urgent travel, I decided it made more sense to keep the card and pay 1.43 cents per SkyMile again this year. Likewise, just this week I redeemed 20,000 US Bank Flexpoints for a first class flight that otherwise would have cost $343. Alternatively, I could have redeemed 27,440 Ultimate Rewards points (at 1.25 cents each), making me feel fantastic about earning 2 Flexpoints per dollar instead of 2 Ultimate Rewards points per dollar at my local gas station.